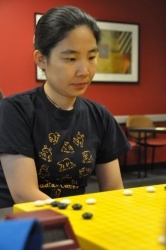 Cathy Li; ( 李晨硕; Li Chen Shuo ) is a professional 1-dan Go player in the Chinese Go Association. at age 7, she started learning Go after famous Go instructor Bai Rui Qiu. at age 20, Enter Shanghai Jiaotong University, During and after the school days, Be invited as the judge and Guest Commentator in many international GO competitions. at the same period, Also be invited as professional GO teacher of Shanghai Ying's GO school. several of her students had won championships at different levels in many national GO Tournaments. 2008, Be The Coach of Canada GO Team for the 1st World Mind Sports Game (WMSG). 2010, Sucessfully organized The 33rd Canadian Open GO Tournament (Vancouver) and Be representative of North American in The 1st Bingsheng Cup World Women's GO championship.